At Bold Idea, we expose students to a big array of jobs in the tech industry. There’s the really cool technology, like mobile app development and wearables, but there are so many other things that make up technology creation. By meeting your team, students can get a broader perspective of what’s possible. And for your employees, company tours are a fun and convenient way to volunteer. Providing opportunities for students to tour your workplace helps them gain a firsthand understanding of your company and industry, as well as the technologies and skills employees use in STEM-related jobs. The types of tours we set up with our corporate partners can vary. Bottle Rocket, for example, hosts our weekly programs and offers a tour on the first day of the semester course. Bold Idea mentors from Dialexa, a Dallas technology research, design and creation firm, invited their ideaSpark team for a weekday visit to meet their colleagues. 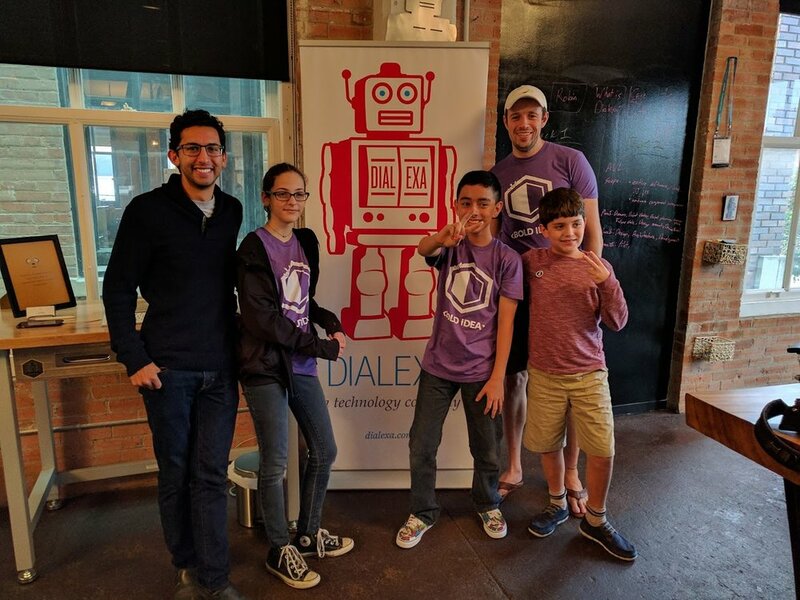 At the end of the company tour, it was the students’ turn to impress Dialexa. Each teen gave a short demo of their creative mobile app project and answered questions from the engineering team. In 2015, the AT&T Foundry invited the Jr. High girls in our Geek for Good program participants to tour its facility, including the IoT lab. The girls then presented their website projects to an audience of AT&T women leaders. Our students have also enjoyed tours of the UT Dallas Arts & Technology Building and VMware. These company tours are giving kids the kind of meaningful, real-world exposure to technology jobs that can prepare them for college and career. What are the benefits of company tours? Research on work-based learning, compiled by Change the Equation, shows clear benefits for students and companies alike. Students explore various fields and careers so they can make more informed decisions about their goals in life and the education they need to reach those goals. Students connect what they're learning in the classroom to the education and skills required for success in today's workplace. Students become more motivated to do well in school and pursue post-secondary education. Companies have opportunities to nurture student interest in careers with their company and in their industry. Companies advance their reputation in their communities as supporters of education, community leaders and providers of good jobs. Companies provide their employees with opportunities to serve as ambassadors for the company and to hone their public speaking, communication and leadership skills. To learn more about what your company can do and to let us know you’re interested in setting up a company tour, fill out the interest form below.